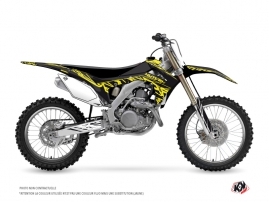 Kutvek Kit Graphik specializes in designing of dirt bike decals. We strive for quality and originality and aim to offer a wide range of graphics kits with unique patterns. Kutvek proposes also a full customization from ground up in order to help you to express your own ideas by tailor-made design. We've maintained our commitment to quality since we began in 2005. 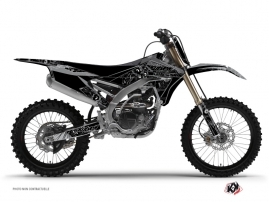 We have worked hard to perfect our dirt bike graphics kits in order to meet even the most particular expectations. The ease of installation of our decals, their bright and saturated colours, as well as their strong resistance to outdoor use place these graphic kits among the best on the market for motocross bikes. Decorate your pit bike with our collections of custom stickers specially made from patented materials for your moto, no matter what brand. 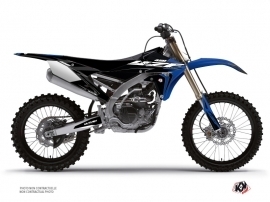 We work with the main producers of dirt bike in order to supply the graphics kits for the majority of MX models. That is why at Kutvek you can find the fabulous vinyl stickers for your Yamaha YZ 125, Honda CRF 450, CRF 250 or KTM 125, KTM 250 EXC. We are also particularly happy to provide you with KTM stickers using the logo of the brand as a licensee. • Stickers are easy to apply because they fit any shape under applied heat and allows for few minutes to remove and reposition them thanks to our special glue. • The colours on the vinyl stay bright for a long time. • The stickers are sturdy and withstand many outdoor uses. • Our personalised stickers provide reliable added protection for motocross bodywork. Our MX decals were tested in the most extreme environment of motocross racing by a bunch of French and international Riders and Team who trust our quality since 2005: Adrien Van Beveren, Jordi Tixier, Tom Pages, Team Luc 1, Xavier De Soultrait, Mickael Pichon, Sylvain Bidart, Loic Larrieu, Evgeny Bobryshev, Daymond Martens, Team 2B, Team Outsiders, Gregory Aranda, Cédric Soubeyras, Benoit Paturel, Cyril Despres, Zachary Pichon, Stéphane Peterhansel, Jean Claude Moussé, Marc Bourgeois, Arnaud Demester, Steve Ramon, Tom Vialle, Kaven Benoit, Milko Potisek. If you are a fan of one of these Riders or Team, ask us to make your MX bike as unique as theirs by reproducing their attractive MX graphics thanks to our exclusive Replica Series! You are looking for the impressive motocross stickers for your TM, Husqvarna or Kawasaki? Kutvek is always here to give you the high quality solution: discover our offer of irresistible designs to choose one that suits your personal taste or go forward and order your exclusive custom decals!